Don’t use your phone while you drive, but be sure you use it if you are in an accident. You drive by them every day on the way to work. A small car accident can cause big backups. None of us ever wants to be in an accident, but the reality is that a traffic accident occurs every 4.5 minutes in Virginia, with over half of those resulting in an injury. If you are involved in an accident, and especially if it results in an injury, one of the best things you can do is to use your phone to take pictures. If you were not at fault you are entitled to compensation from the other driver’s insurer. But keep in mind that insurance companies are there to make money – so they will do all they can to pay you as little as possible. They may try to prove that you were partially at fault or that the damage was not as extensive as you claim. 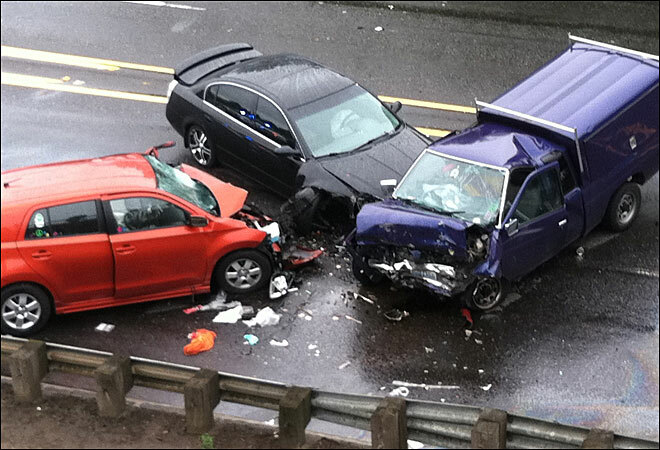 Taking photos at the scene of an accident can help you prove your claims. If the other driver was uninsured and you have to go to court, these pictures can provide evidence vital to your case. -All sides of your to your vehicle, especially all damage. It can be helpful to include something in the photograph for scale. You don’t want the insurer thinking a one foot dent is a three inch dent, so be sure to include your hand or another item for scale. -Surroundings. Make sure you take pictures of any skid marks in the road, as well as anything either car hit like guardrails or telephone poles. These can help show speed and force of impact. -Your injuries. Any cuts, bruises, bleeding, etc should all be photographed. And it can’t hurt to keep taking pictures of those as they heal in the days or weeks following the accident. You never know what may cause long-term damage and the more evidence you have, the better.